With the change in technology with respect to time, the way to convey or send messages are changed.And in present time Everyone wants better Security and privacy their messages. Communication in secret language or codes is known as Cryptography.Encrypted mail is a type of mail which is a mail with a secret language.Encrypted Mail is used to protect emails from password breaches and the NSA.We can understand it with Encoder-Decoder.Mainly Encoder-Decoder is used in communication (Electronics Communication).Let there is a sender which writes the message(or E-Mail) and then the Original message is Encoded It means that the Original message is coded in a secret Language(A set of codes) .after Encoding message forwarded to the Receiver and when it reaches to the Receiver then the message is decoded with the same language and then the original message can be found.And anyone or anything(Other than Sender and Receiver) will try to read or decode these types of email then Encrypted mail will be self Destroyed. I know above technical lines are hard to understand but as a B.Tech (EC) student, i tried my best to make everything simpler.So today In this post, we’ll walk you through Encrypted Mail and how to encrypt your email using your own smartphone or other devices. So First you want to know what is Email encryption or what is Encrypted Mail? Above paragraph is enough to understand but I found some very good definition of Encrypted Mail on the net so “Encrypted Mail is encryption of email messages to protect the content from being read by other entities than the intended recipients. Email encryption may also include authentication.” Most emails are of a type of not encrypted. By means of some available tools, persons other than the designated recipients can read the email contents. Email encryption has been used by journalists and regular users to protect privacy.Email encryption can rely on public-key cryptography, in which users can each publish a public key that others can use to encrypt messages to them while keeping secret private key they can use to decrypt such messages or to digitally encrypt and sign messages they send.If you’re looking for a little personal privacy in your communications with friends and loved ones, or you just want to trust that the documents you email to your accountant or client aren’t being intercepted and read, you’ll need to encrypt those messages. Thankfully, There are some full-featured email clients (like Apple Mail, Microsoft Outlook or Mozilla Thunderbird)which provide native support for S/MIME secure email (digital signing and message encryption using certificates).Other encryption options include PGP and GNU Privacy Guard (GnuPG). Free and commercial software and add-ons are available as well, such as Gpg4win or PGP Desktop Email that support the OpenPGP type of encryption. In above Paragraph We have said that there are some Email clients are available which support Secure mail but there are also some more clients are available which supports Encryption of Email. ProtonMail is a free and web-based encrypted email service founded in 2013 at the CERN research facility by Jason Stockman, Andy Yen and Wei Sun.ProtonMail is designed as a zero-knowledge system, using client-side encryption to protect emails and user data before they are sent to ProtonMail servers, in contrast to other common webmail services such as Gmail and Hotmail. ProtonMail is run by Proton Technologies AG, a company based in the Canton of Geneva, and its servers are located at two locations in Switzerland, outside of US and EU jurisdiction. ProtonMail is the Only service that NSA can’t Assess.An email sent from one ProtonMail account to another is automatically encrypted with the public key of the recipient. Once encrypted, only the private key of the recipient can decrypt the email. When the recipient logs in, their mailbox password decrypts their private key and unlocks their inbox. Emails sent from ProtonMail to non-ProtonMail email addresses may be sent with or without encryption. With encryption, the email is encrypted with AES under a user-supplied password and then stored on ProtonMail’s servers. The recipient receives a link to the ProtonMail website on which they can enter the password and read the decrypted email. ProtonMail assumes that the sender and the recipient have exchanged this password through a back channel.It also Supports Android and iOS operating system and has a web Version as the interface. Tutanota is an open-source end-to-end encrypted email software and freemium hosted secure email service based on this software, developed and provided by a German company Tutao GmbH.Tutanota was founded at the end of 2011 with the idea of making secure email easier than extant options like PGP.It’s similar to the likes of encrypted email Products ProtonMail, StartMail and Hushmail but says it’s putting more emphasis on usability, with a clean interface, features such as attachment encryption and support for different devices.With Tutanota encryption is done locally, on the client device, secured with a user’s own password (so that also needs to be strong, and their own devices need to defended from malware to ensure email security), before being uploaded and sent to the recipient via Tutanota’s servers, and then decrypted on the recipient’s device.Tutanota has no password reset option, so it says there is no way for it, as the email service provider, to be able to decrypt the data it’s sending. Which means it can’t be strong-armed by governments to hand over data. Nor is it data-mining your emails to sell intel to advertisers.it’s doing encrypted email in the web browser and also offering iOS and Android apps.It also takes donation to give premium services. CounterMail is a secure and easy to use online email service, designed to provide maximum security and privacy without any unnecessary complexity.You can access your email account at any time, from anywhere in the world. Your account will always be encrypted and anonymous.CounterMail’s encryption works automatically and transparently, it requires no specialized computer skills or knowledge. If you are comfortable using services like Hotmail or Gmail, you will be comfortable using CounterMail’s secure email!They are using a strong encryption protocol called OpenPGP, with 4096 bits encryption keys to protect your data. To the best of publicly available information, there is no known method which will allow a person or group to break OpenPGP:s encryption by cryptographic or computational means.You can use its Services on Linux, Mac OS, and Windows OSs.You can try it for free for one week but after that, You have to pay $6.33/month. Posteo is not free and you have to pay 1uro per month for its services.Posteo is a company founded in 2009, companies in the legal form of a registered person businessman with headquarters in Berlin. The company provides encrypted e-mail services, contact management and calendar in ad-free and chargeable. The website of Posteo is available in German and English. The Web Interface offers a free voice dialing for more than 70 languages to operate the mailbox.In Posteo both registration and payment are anonymous possible. The data transfers between customers and Posteo are consistent with TLS encrypted. Posteo supports since August 2013, the encryption features Perfect Forward Secrecy, which is also supported by the e-mail providers like Google, Yahoo, GMX, Web.de, and T-Online.In this case, for each connection random, a new key generated by the connection is encrypted. This is to prevent a subsequent decryption of data tapped. Encryption is performed using an extended certificate of company Red Hat. Since the 12 May 2014 Posteo supports technology DANE / TLSA (DNS-based Authentication of name entries) and thus includes various vulnerabilities of Transportwegverschlüsselung commonly used SSL / TLS from; since the browser DANE does not support by default, the client is a browser add-on must first install. Also, the hard drives located in Germany Server are AES -encrypted. Since 12 November 2014 a two-factor authentication when using possibly via the browser, as it is also offered in Outlook.com, Gmail and Yahoo mail. Since October 2015 uses Posteo HTTP Public Key pinning to the HTTPS connection of the web interface secure for users. Hushmail is a web-based email service offering PGP-encrypted e-mail, file storage, and vanity domain service. Hushmail offers “free” and “paid” versions of service. Hushmail uses OpenPGP standards and the source is available for download. If public encryption keys are available to both recipient and sender (either both are Hushmail users or have uploaded PGP keys to the Hush keyserver), Hushmail can convey authenticated, encrypted messages in both directions. For recipients for whom no public key is available, Hushmail will allow a message to be encrypted by a password (with a password hint) and stored for pickup by the recipient, or the message can be sent in clear text. As of December 22, 2015, Hushmail has a score of 1 out of 7 points on the Electronic Frontier Foundation’s secure messaging scorecard. Hushmail has received a point for encryption during transit. It is missing points because communications are not encrypted with keys the provider doesn’t have access to (i.e. the communications are not end-to-end encrypted), users can’t verify contacts’ identities, past messages are not secure if the encryption keys are stolen (i.e. the service does not provide forward secrecy), the code is not open to independent review (i.e. the code is not open-source), the security design is not properly documented, and there has not been a recent independent security audit.AIM, BlackBerry Messenger, Ebuddy XMS, Kik Messenger, Skype, Viber, and Yahoo Messenger also have a score of 1 out of 7 points. 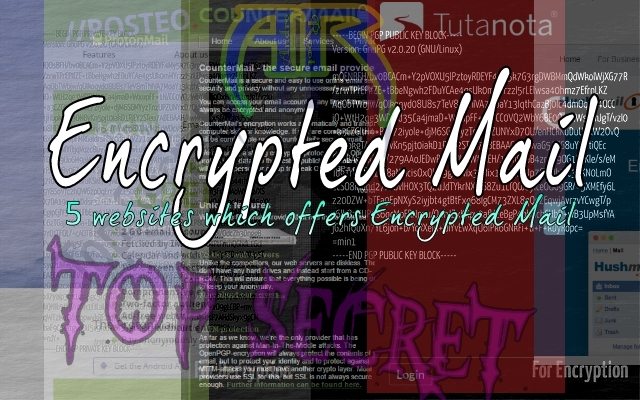 So in this Post, We have discussed Encrypted Mail and Some Popular Websites which offers Encrypted Emails.if you found Any other website which has Encrypted E-mail service then share it through our Comment section.